The core component of this series, The 13 Box System, is used by thousands of people around the world, including members of the content team at Constant Contact. It’s a structure I use in my own business to help clients build authority and achieve success. The first thing you need to do is click the link to the first worksheet below — download it, print it, and answer the questions on in it. Then come back and continue reading. Once you’ve read through the explanation to the questions below you’ll probably want to answer the questions again. Then, once you’ve done that, either pin the worksheet to your notice board or put it somewhere safe; we’ll be coming back to it through the series. Ok. Let’s get started with ‘Purpose’. 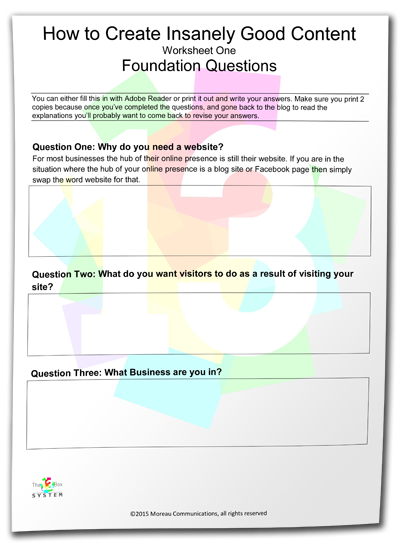 Question 1: Why do you need a website? Even after all these years of asking this question, the number 1 response still stumps us. Can you guess what it is? The answer to this question is all about the purpose of your website. Without a purpose, you can’t have clarity or focus. Firstly, don’t confuse purpose with outcome. When you think outcomes, you’re thinking about what’s good for you, purpose is about your market audience and their higher good. Yes, it’s okay to have overlap with your purpose theme, most businesses will. But try to concentrate on the dominant purpose. If the website is the online extension of your off-line business, then you’ll want to create alignment between the two. You may also be thinking that we missed, driving business as a purpose. In most situations, making the sale is a result of your website, not its purpose, and we’ll speak to that in the next question. Question 2: What do you want visitors to do as a result of visiting your site? Chances are you pretty much nailed the answer to this question. Although we do get a large percentage of clients who aren’t quite sure what they they’re looking for. We’re going to come back to this question in a later post and drill down inside it because often you’ll need to develop a number of touchpoints between their first visit and getting to your ultimate conversion goal. As you can see, we are being transparent here; you don’t have to be as candid with your audience. Question 3: What business are you in? This question throws virtually everyone we ask — and it’s meant to. In reality, the business you are in has little to do with the industry you’re in. When you think about the answer to this question, what you want to be thinking about is: What is it that your client will feel as a result of what you do? Try to drill down to the emotional level because decisions are often based on emotion and backed with logic. If you think about insurance, for example, you could say that at the emotional level they provide “peace of mind” to their clients. If you’re a builder, you don’t build houses you “create homes,” or if you sell home lighting you could say you’re in the ambience business. The key is that it’s all about your audience, and nothing about you. Take your time answering this question, get out another piece of paper, and just write down all the emotional level attributes that a client might associate with having purchased a product or service from you. You can even go one better and call a few of your loyal clients and actually ask them directly. You know your ‘Why,’ you’ve articulated your purpose, and opened the door to clarity and focus. You know ‘What’ result you are trying to achieve. You now have the emotional connector between ‘Why’ and ‘What’. Knowing the answers to these three questions actually makes your job infinitely easier, and — believe me — you’ve just elevated yourself into a new level of thinking. 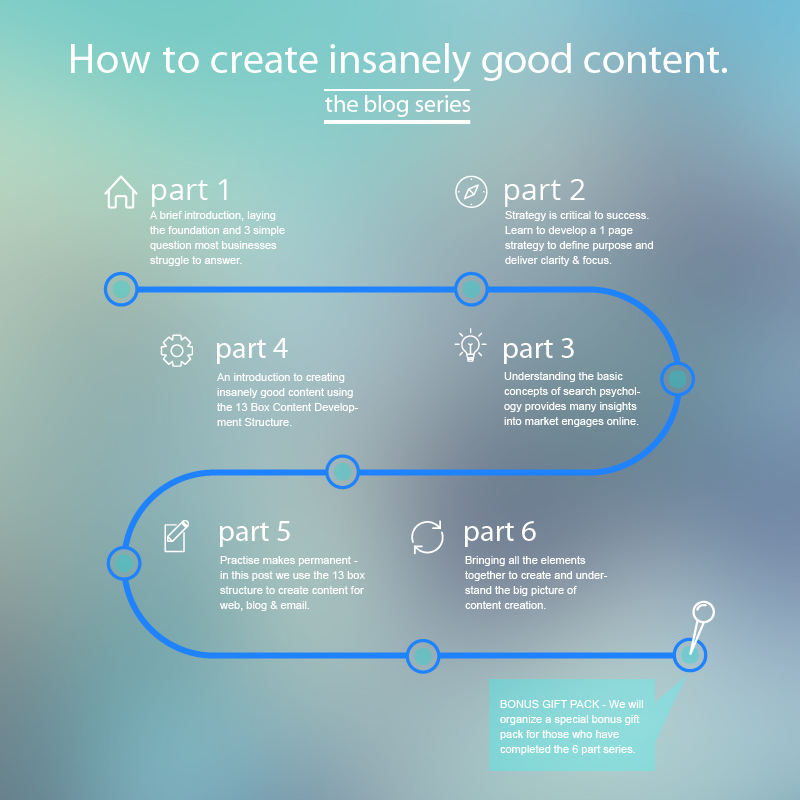 In the next part of this series, we’ll build upon this thinking as we develop your one-page strategy. You can read Part 2 here. We look forward to hearing your feedback and will do our best to answer any questions you may have. Let us know how we can help by leaving us a comment!